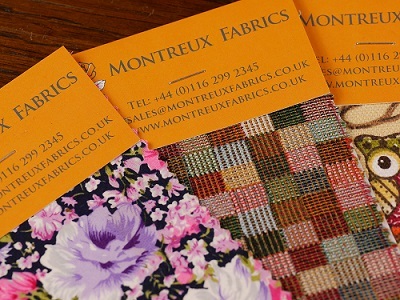 Swatches of ALL of our fabrics are available. Although every effort is made when photographing each of our fabrics to ensure that the product images are representative of the fabrics as best as possible, colours may vary according to settings on your screen and therefore can only be an approximation of the actual product. We also know the importance of touch and feel when it comes to fabric, and even the most accurate of images fail to convey this. We therefore strongly encourage you to purchase a swatch of your desired fabric before ordering it in a specified length. Swatches measure approximately 6cm x 10cm and are charged at £1 each. Each swatch is cut from the roll, mounted on card and clearly labelled with the corresponding product code (‘MF number’) and colour. All UK swatch orders qualify for free delivery and will be sent by Royal Mail post. Swatch orders to countries in the EU are sent by Royal Mail's Airmail service at a charge of £4. Swatch orders to countries outside the EU are sent by Royal Mail's Airmail service at a charge of £8. In the unlikely event that we are unable to provide one or more of your swatch choices, we will inform you as soon as possible. Our swatch service is intended to help you choose the perfect fabric for your needs, and therefore swatches are non-refundable. They are yours to keep.